It’s day one of the Galle Literary Festival, but Ian Rankin is too absorbed in a conversation about British crime fiction to make his way down to the Fort. “Can you imagine Ms. Marple walking into a police station and the cops saying, ‘Oh thank God, Ms. Marple, thank God you’ve arrived to help us deal with this racist murder in this housing estate’?” While it’s true that Rankin’s own Inspector Rebus rarely receives a warm welcome at St Leonard’s Police Station, that’s beside the point. Rebus is going to be a star in Galle. Rankin, who holds the record for having six novels simultaneously in the Scottish top 10 bestseller lists, insists on placing his fictional detective in very real world contexts. Over the course of 17 books, xenophobia, sexual abuse, religious bigotry and political corruption have all been introduced into Rebus’ universe. And even more unusually, Rankin writes detective novels where justice is not always served. His publishers are sometimes frustrated to find themselves at the mercy of a vague plot. Though he is frequently pressed to tidy up his endings, Rankin’s approach seems to work well for a particularly loyal fan base. Often, a new Rebus novel will sell several hundred thousand copies within months of its release. Translated into 20 languages, Rankin has successfully immortalized Rebus’ Edinburgh in the minds of millions. There’s even a walking tour that brings visitors to the street on which Ian’s detective lives and travellers often end up at Rebus’ drinking hole – the Oxford Bar. But the Edinburgh of Rankin’s novels is not one tourists are familiar with. When he first began writing in the eighties, the city was among those worst affected by HIV/AIDS in Europe. Heroin flooded the streets as crime rates rose. “No one was talking about it or writing about it.” When Rankin decided to highlight these issues in his novel, he brought to it the perspective of an outsider to the city. Once having decided to take on the world of popular fiction, Rankin found the going tough. His resume includes unexpected stints as swineherd (he lost that job when a pig got drunk and died after he fed the herd fermented grape fruit skins), alcohol researcher (stop the presses: teenagers will lie about the exact amount of alcohol they’ve consumed) and a vocalist for a punk rock band ‘The Dancing Pigs,’ (he’s working hard to suppress old recordings). Much of this is detailed in a diary he kept from his early teens into his thirties. The author will occasionally flip back to the pages where he was struggling to establish himself as a writer. “It’s fun to go back to read the young, tortured Ian’s thoughts on failure,” he says. And there seemed no dearth of it – his first novel – ‘Summer Rites’ – was never published and the first in the Rebus series ‘Knots and Crosses’ (1987) was turned down five times by publishers. Published in 1997, ‘Black and Blue’ was the 8th Inspector Rebus novel and it won the Macallan Gold Dagger for Fiction. It would still be a few more years and a few more books before Rankin could afford to pay for the mortgage on an apartment in Edinburgh, but by 2002, Rankin was being hailed as the ‘King of Tartan Noir’. That year he was awarded the OBE in the Queen’s Jubilee Birthday Honours List. Having to work so hard for his success kept him grounded, while the long wait prepared him well for it, he says. And despite having climbed to the top he’s never really slacked off. But Rankin is still keeping an eye on Rebus. “I know where he is – he’s working cold cases in the same building as Malcolm Fox (the star of Rankin’s newest book, ‘The Complaints’). Fox, who couldn’t be more unlike Rebus, polices the police and Rankin is considering having Fox investigate Rebus for some past misdemeanour. He might even do another novel based on Rebus’ current cold case or on Siobhan, another recurring character. But for now, Fox is allowing Rankin to write about a different Edinburgh. “The city is just a huge crime scene as far as Rebus was concerned,” he says, but Fox appreciates it. On a personal level, he might even be capable of serious emotional commitment. “I can see Fox settling down…” says Rankin, but what he can’t imagine is writing 17 books about him. Clearly, Rebus is going to be sorely missed. Still, whatever the year brings, Rankin intends to keep writing – “it’s how I make sense of the world,” he says simply. Published in The Sunday Times, Sri Lanka on January 31, 2010. Words by Smriti Daniel. Pix by Saman Kariyawasam. 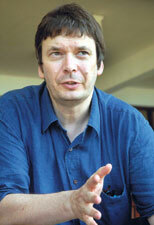 Tags: Galle Literary Festival, Ian Rankin, Inspector Rebus. Bookmark the permalink.